Of all the good things about raising backyard chickens, one of the biggest negatives is FLIES. Not kidding. When you don't have property, but instead you have a small yard and are raising those extreme urban chickens, flies in your coop are one of your main concerns. The first year I was raising chickens I almost gave up because of flies. They were everywhere despite my best attempts. I experimented with all the tricks but not much was working. Finally, after a lot of research and testing, we found what actually works to control flies in the urban chicken coop. 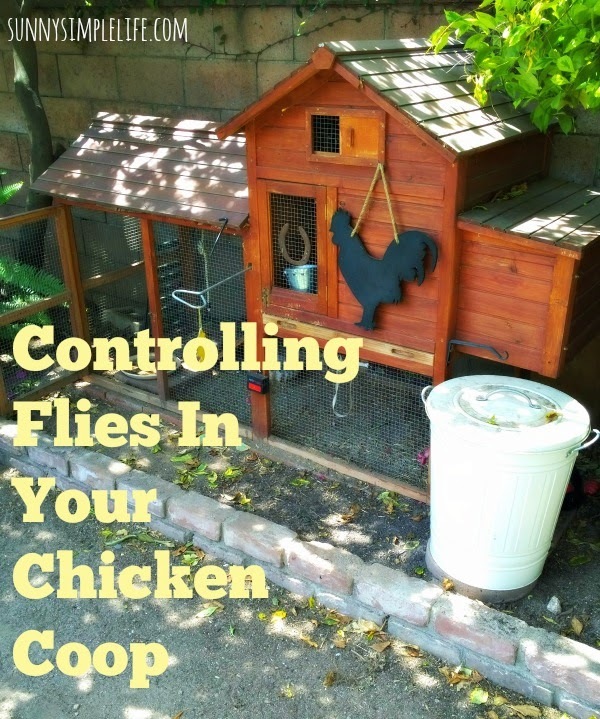 I will share the steps we take for a successful backyard chicken coop in the warm months when flies are most bothersome. 1. Don't keep too many chickens for your yard. Chickens poop all the time. So avoid the urge buy chicks every time you head to the feed store or to keep too many chickens for your space. 2. Pick up droppings or rake up daily if possible during warmer months when flies are present. In a backyard setting this is doable and worth it. Leaving droppings for a deep mulch or composting in the run has not worked in our small yard. This goes for other animals. Pick up early and often! I also find if I rake up the coop real quick and put leaves and debris in the compost bins this works great. 3. Keep things dry. Especially in the coop and run. Even in your yard, water less frequently and preferably in the evening so things are drier by morning. Try sand in the run. I have found sand in the chicken coop run area really dries the poop out fast. Dry poop = less flies. 4. For really warm weather, I use Diatemacious earth in the chicken feed and sprinkle in the coop and run. Also, hanging some sticky fly strips help to catch mature flies. 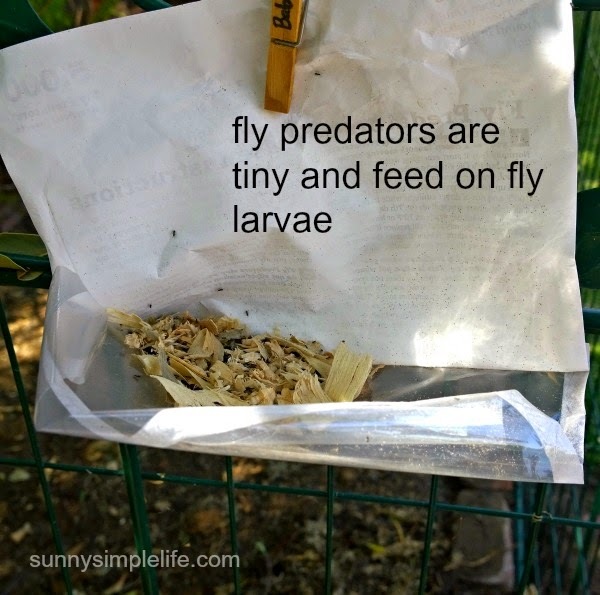 The stinky traps do not work for a small backyard because they will attract flies to your garden. 5. I do use fly predators. They have been amazing. 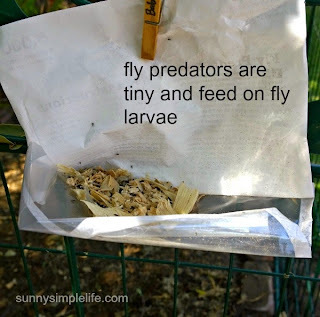 They are tiny, and I mean teeny tiny, flying predators that feed on fly larvae. They do not bother humans or pets. I will share more next time on how I disperse the predators and the best ways to do this. I think the problem of flies in the chicken coop is one of the biggest draw backs to raising chickens in small backyards. You MUST be pro-active in controlling them before they get out of control. Learning something new everyday!! Love it, thanks for sharing! This is so interesting, Elaine! You know I've always been fascinated by your wonderful chicken coop and run. We have plenty of room up here on our farm, but I still can't get past taking care of chickens when it's -20 degrees F.(or colder), trudging through the snow. Sounds like you've got your fly problem under control. Yes, caring for chickens in winter in SoCal is pretty easy. We used to use Spalding Labs fly predators for our horse stalls. They are so easy o work with and help a lot! Where do you get fly predators? I live in Maine and with the cattle we have lots of flies, however I have fly jars where I catch millions of them. Just started raising chickens though. Hi Charlene. I get the fly predators from Spalding Labs. You can google them.